HEAVY metal usually means a lot of racket, but not here. Across the 30 or so rolling acres of his farm in southwestern Tuscany, the German sculptor and musician Paul Fuchs, 74, cultivates the Giardino dei Suoni, his Garden of Sounds. Weighing tons, his spindly abstractions of steel and bronze — “The Long I,” “Cut Out,” “0 + 1” — inscribe the landscape like quick strokes and squiggles of some titan’s pen. Rising as high as 100 feet they catch movement in the air and give forth vibrations that verge on silence: the gentlest of music. One, “Visit From the Extraterrestrial,” tolls like a buoy on the churning sea. 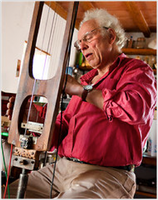 Trained as a blacksmith, then as an artist, Mr. Fuchs has evolved into a musician by inner necessity, without any formal training. his unusual instruments, including the “wooden hand." “The rhythm of the hammer on iron, the sheer physical work, was always music to me,” he said. “Without the right flow you strike the metal on the anvil, and nothing happens.”Apart from the principal dwelling, a stable for the horses and a workshop that sometimes doubles as a gallery, his Tuscan compound has a barn packed with an astonishment of instruments: a thunder sheet here; a suspended assemblage of hollowed-out wooden blocks there; assorted bells, whisks and sticks. There are motorized sound generators too, one outfitted with heavy-duty rubber boots. Mr. Fuchs likes to move among all these at an unhurried pace, spinning out his exotic, hushed yet earthy toccatas. He plays every few days for his own enjoyment. Private tours of the grounds, conducted for groups of eight or more (by reservation only, at paul.fuchs@tiscalinet.it), feature performances too. There are also public performances at other locations. “As a little boy,” Mr. Fuchs said, “I wanted to learn the violin, but my hands weren’t built for that. Working with metal, I could never mold them to conventional instruments. I made trumpets for other musicians and also horns of copper, wood and bronze that I could blow myself: simple sculptural tubes and cones that made amazing sounds. I still play them. And I made percussion and string instruments in the same style. Before his move to Tuscany three decades ago, Mr. Fuchs and his first wife, the vocalist Limpe Fuchs, toured Europe in a tractor-drawn trailer, with two boys and a sheep, improvising on a battery of instruments of their own making. If Wagner could dream up a Wagner tuba, why shouldn’t there be Fuchs horns, a Fuchs bass, a Fuchs harp? Originally developed at the request of a music therapist, the spooky ballastsaiten (weighted strings) quickly became an integral part of the Fuchs paraphernalia. It consists of strings, attached weights and a drum head that resonates when the strings are brushed or plucked. Mr. Fuchs has also developed a sort of caveman’s xylophone of carefully selected granite plates. He and Limpe Fuchs, who describes herself as a composer of acoustic and visual events, went their separate ways long ago, musically and personally. Their son Zoro Babel, a percussionist, still performs with both parents and with other musical adventurers, like Markus Stockhausen, son of the German composer, visionary and crackpot Karlheinz Stockhausen. Mr. Fuchs’s second wife, Gaby, is a carpenter, and together they have three children, all of whom have flown the nest. A woman of many talents, she whips up a rustic plate of pasta garnished with herbs and tomatoes from her garden, converts tracks from vinyl LPs long out of print into handy MP3 files and attends to business correspondence. The Fuchses seldom leave the property now, and their appetite for modern conveniences is selective. They pump their water by hand. Over the years Mr. Fuchs has captivated musicians across a wide spectrum. An early collaborator was the Austrian star pianist Friedrich Gulda, who died in 2000 at the age of 69. A great original of his generation, Gulda was constantly at pains to upset the apple cart of routine. His complete Beethoven sonatas, recorded when he was 20, caused a sensation. Later he immersed himself in jazz, appearing at Birdland and recording with Herbie Hancock. Yet Mr. Fuchs recalls their four-year association in the early ’70s with undisguised ambivalence. So it seems right, somehow, that Mr. Fuchs in time achieved a deeper harmony with the American Indian flutist R. Carlos Nakai. The two met more or less by chance near Woodstock, N.Y., in 1981, during a workshop of the Creative Music Studio, an organization at the crossroads of jazz and world music. 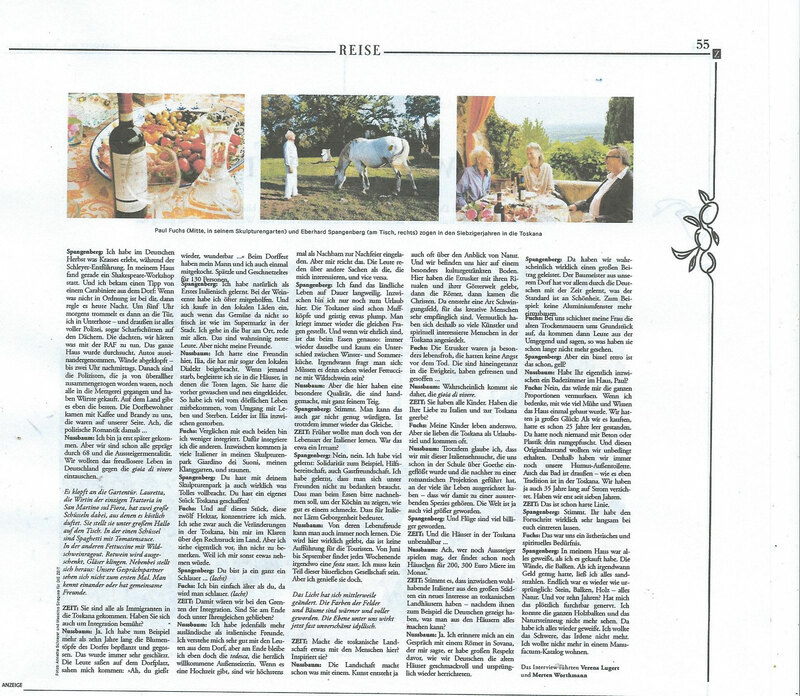 They stayed in touch, and in 1988 Mr. Fuchs invited Mr. Nakai along on a tour of West Germany. “What many native people in the Americas do when they meet for the first time,” Mr. Nakai said recently from Salt Lake City, where he was on tour, “is to ask, ‘Who are you?’ It’s not the standard business-card approach. It’s not ‘Who do you work for?’ but ‘How are you related to your own people, what’s your ancestry, your heritage?’ That leads you to differences and similarities of how we belong together as multicultural beings. No one belongs to just one heritage. Pamela Hyde-Nakai, Mr. Nakai’s wife, remembers the amazing logistics of the tour. Did they start from scratch every time or develop a playlist of themes and patterns they embroidered on? Both approaches came into play, Mr. Nakai said, but in the end “most of our appearances were entirely of the moment.” Recordings exist but are hard to find. And truthfully, you probably had to be there. For Mr. Fuchs a collaborator’s musical pedigree on is on one level completely unimportant. In a recent e-mail from Germany, Mr. Schlichtig acknowledged the challenge of working with Mr. Fuchs. “Of course Paul isn’t a formally trained musician, but he’s a natural, a primal musician,” he wrote. “A visual art like sculpture has the same or similar laws and principles as music, and with Paul you feel that very well. Working with him, I had first of all to get rid of my ‘classical patterns’ so as to be free for music that is all mine. So we just plunged in, listened to tapes of what we had done and then talked about what worked and what didn’t, figuring out how our ideas correspond, contradict or complement each other. Is it music? 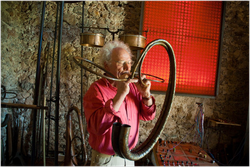 In calling his sculpture park a garden of sounds, Mr. Fuchs implicitly raises the question. Before the pieces came to rest in the Tuscan hills, many who saw them liked to say that they resembled cryptic musical notation. Mr. Fuchs shrugs off such fancies. “Sound is something fundamental,” he said. “Someone who works with sound is an artist in sound. A musician is someone who takes sounds — sounds of a scale or sounds free from a scale — and fuses them with spirit and heart’s blood. That’s what it is to make music. Wer, von Siena kommend, die eindrucksvollen Ruinen des Zisterzienserklosters San Galgano hinter sich hat und in Richtung Massa Marittima weiterfährt, kommt in eine waldreiche Hügelregion, die auf den ersten Blick so gar nicht Italienisch aussieht. Es wundert einen darum auch nicht, wenn man erfährt, dass dort viele der verstreuten Bauernhöfe von Deutschen aufgekauft worden sind. Achim Freyer, Opernregisseur, Bühnengestalter und Maler, ist nur einer der Künstler, die sich hierher zurückgezogen haben. Sein Nachbar ist der Bildhauer, Klangskulpteur und Musiker Paul Fuchs, den wir besuchen wollen. Wir haben das Auto abgestellt und gehen bergauf durch einen Steineichenwald, der an jeder Wegbiegung mit einem skulpturalen Ereignis überrascht. Stahl, rostig rauh oder blitzend glatt, wirkt hier, im lichten Laubwald, wie ein Stoff aus einer fremden Welt. Und entsprechend eigensinnig sind die Formen aus Stahl, die der gewachsenen Natur mit exquisit artistischen Bewegungen antworten. Schlanke Rohre steigen in sanften Schwüngen über die Baumkronen hinauf; dünne Eisenruten, die sich in unverschämter Leichtigkeit kurvig emporschwingen, zeichnen surreal feine graphische Linien in den Himmel, wiegen sich sanft in der Luft oder lassen auf ihren nadeldünnen Spitzen - umgekehrte Mobiles - strichdünne Querstangen balancieren. Oben auf dem Hügel hebt ein schlanker Mast eine im Wind rotierende, blitzende Krone aus Edelstahl ins Blau des Himmels hinauf. Wir betreten eine große Lichtung mit malerisch verteilten Baumkronen, mit grasenden Pferden und mit geduckten alten Steinhäusern, in denen sich Paul Fuchs wohnlich eingerichtet hat. Während wir noch zwischen den locker verteilten Skulpturen umhergehen und den gestisch freien Bewegungen der stählernen Linien auf ihrem individuellen Weg in den Himmel mit den Augen folgen, setzt ein archaisches Klanggewitter ein. Paul Fuchs begrüßt seine Gäste mit einer Improvisation auf dem wohl ausladendsten Musikgerät, das er je geschaffen hat - einer Art Lithophon. Dünne, roh gespaltene Steinplatten unterschiedlicher Länge sind so auf Holzböcke gelegt, dass sie beim Anschlagen prägnante Töne unterschiedlicher Höhe von sich geben. Die Klangzungen sind nicht gestimmt; die Natur antwortet also mit einer Melodie von minimalen Zufallsschritten auf die rhythmischen Vorgaben. Der Effekt ist gewaltig: Wo ein Xylophon zu artig zivilisiertem Zuhören einlädt, entführt das panisch laute Lithophon den Hörer in ungezähmt wilde Klangregionen. 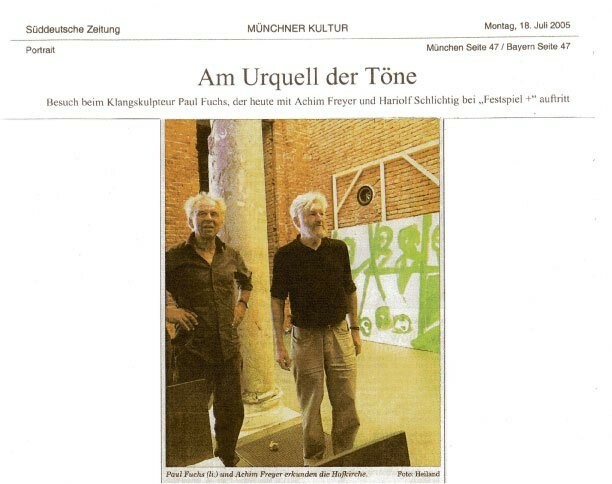 Der Musiker und Töneproduzent Fuchs, der mit seiner damaligen Partnerin Limpe und mit Friedrich Gulda in Avantgardetagen musikalische Grenzgänge absolviert hat, gesellt sich zum Bildhauer Fuchs, der mit biegsam mobilen, filigranen Stahlgebilden stumme Musik in der dritten Dimension macht. Eines der Häuser auf der Lichtung ist ganz für die Experimente mit klingendem Material reserviert - eine Ton -Werkstatt im wörtlichsten Sinne. Hier wurden Lärm -, Geräusch - und Musikinstrumente gefertigt, die sich fast aller bekannten Tonerzeugungsverfahren bedienen. Ein urtümlich zum Kreis gezwungenes Blechrohr mit monströsem Mundstück lässt unanständige Brülltöne und schräge Intervalle über die Lichtung fahren; mit diesem Schreck-Horn kann man jeden Feind in die Flucht schlagen. Drinnen in der Tönekammer sind die Instrumente so neben - und hintereinander aufgestellt, dass sie alle leicht zu bedienen sind und vielfach sogar gleichzeitig gespielt werden können. Am meisten beeindrucken die übermannshohen vierbeinigen Eisengestelle in deren Mitte je ein mit Gewicht stramm gezogener dicker Metalldraht fast bis zum Boden herunterhängt. Ein lampenschirmartiges Gebilde - eine ausgespannte Membran - schließt sich oben so um den Draht, dass Töne der vielfältigsten Art entstehen, wenn die Stahlsaite mit einem Bogen in Vibration versetzt wird. Das unheimlich dunkle metallische Dröhnen - es scheint aus der Urwelt herüberzuschallen - mischt sich mit reinen Glockentönen, die hängenden Stahlstangen entlockt werden und minutenlang nachhallen. Elektrisch betriebene Klopfinstrumente schieben mechanische Rhythmen darunter; dicke Eisenpfannen, in denen schwere Kugeln satt tönend kreisen, beginnen sich zu heben und zu senken; die Brettchen eines frei hängenden Xylophons warten auf den Schlagzeuger, der ihnen Töne entlockt. Paul Fuchs geht wie ein Zaubermeister zwischen seinen Instrumenten hin und her. Er weiß, wie man die Klanggeister erregt und wieder beruhigt. Er improvisiert an diesem Tag mit Hariolf Schlichtig, dem Münchner Bratschen-Virtuosen und -Lehrer, der mit seinem edlen Instrument und mit dem wie ein Florett geführten Bogen die aberwitzigsten Vierteltonfolgen, Mehrfachgriffe, Zupf - und Scharrgeräusche erzeugt. Im überraschenden Mit - und Gegeneinander organisieren sich die erzeugten Klänge zu einem mächtigen Tongemälde, das sich kontinuierlich wandelt. Ein Idealfall für die Münchner Konzertserie "Festspiel +", denkt jeder, der den beiden bei der Tonarbeit zusieht. Und tatsächlich haben "Festspiel +" und der "Münchner Klaviersommer" Fuchs und Schlichtig mit ihrem prominenten Parner Achim Freyer zu einer höchst ungewöhnlichen, genreübergreifenden Veranstaltung heute um 20 Uhr in der Allerheiligenhofkirche eingeladen. Die Klangskulpturen von Fuchs werden mit den Bildwerken von Freyer korrespondieren. Schlichtig wird vor den Improvisationen Stücke von Kurtág und Berio spielen. Und Freyer wird nicht nur als Maler zu erleben sein, sondern ausgiebig auch als Literat und Musiker am Klavier. Korrespondierend zeigt die Galerie Helmut Leger, Herzogstr. 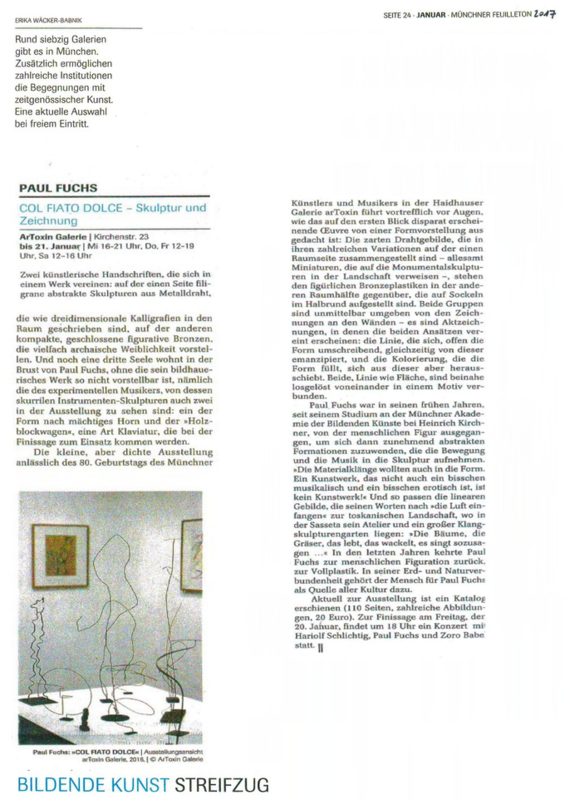 41, Bildwerke von Paul Fuchs und Achim Freyer - und morgen um 19 Uhr gibt Freyer dort die Performance "freyerredenüberkunst".